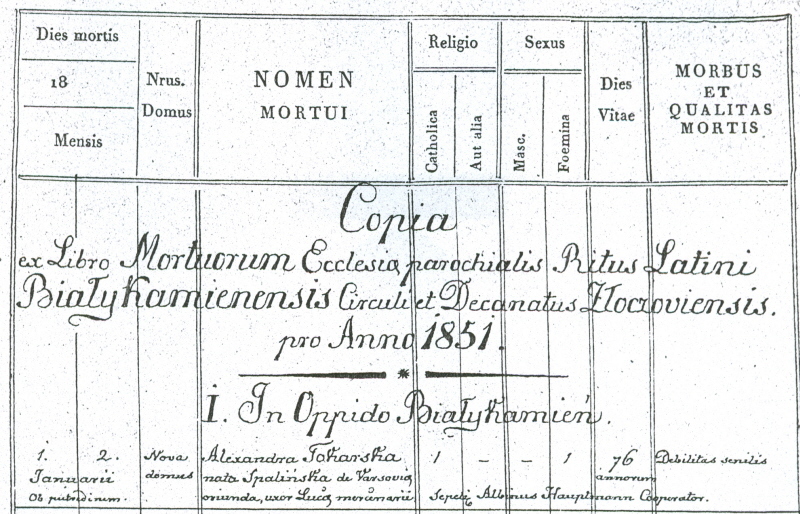 One of the most interesting features of the records from Galicia/Halychyna during the years of the Austrian rule (1772 – 1918) is the House Number. The House Number is the number of the house where the particular event took place, e.g.. birth, marriage or death. One can quickly run down this column and look for specific house numbers to easily find ancestors. Also, it’s a great way to track movement of families within the village. Often, a house was occupied by several families. One can easily find other families living in the same house as your own ancestors. This clue would take you to research that other family’s line back to see if there is a connection to your own family. Without seeing the House Number, you might not have known to take this course of action. House Numbers were usually assigned chronologically, with No. 1 being in the center of the village or near the church or at one end of the village. The numbers increase as they numbered the houses out from the center or church or across to the other end of the village. As a new house was built, it got the next number in sequential order. As you can imagine, soon the order of the numbering lost it’s specific geographic location. So, House Number 95 may be on the opposite side of the village from House Number 96. Earlier numbers, though, maybe next to each other if the houses were next to each other at the time the numbering system for that village was developed. There are certain misconceptions about the House Number that must be mentioned. One should not jump to conclusions or over estimate the real value. Keep in mind that many births occurred at a neighbor’s, relative’s or even the midwife’s house. Therefore, the house number that was recorded by the parish priest on the record may not necessarily be the family’s home. 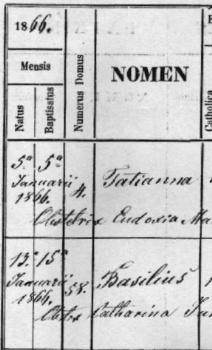 For marriage records, many times only one House Number was written down by the priest. Though my experience shows that this was usually the groom’s House Number, it was not always so. Sometimes, the House Number didn’t belong to either of the married couple, making me wonder where the connection is. Could it be a priest’s error? 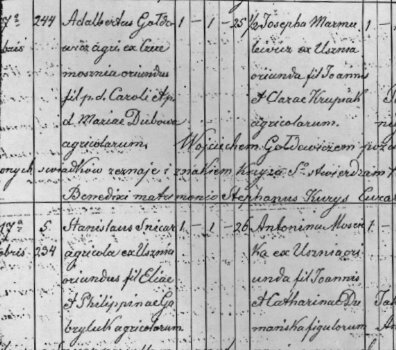 Could the error have been made when a duplicate copy of the registry was written for the Bishop’s Consistory (such copies were known as the "Bishop’s Copies")? One should never look ONLY at the House Number for ancestors in the parish books. You must also check names, of course. In most cases, this House Number was abandoned long ago before anyone living can remember. However, there is an exciting source of records available, known as Cadasters, which can expound on the House Number as well as lead to more ancestors. I personally feel that these records bring all of the vital records to life. Nova Domus, meaning "New House". When I visited the village of my ancestors, I asked several people about the House Numbers. No one remembered any of the house numbers assigned during the Austrian rule. However, some residents did remember that the numbers assigned in the years between the wars, when the region was controlled by Poland, replaced a previous system. However, after WWII, the houses in these three villages were changed yet again. Some of the older residents even remembered their own House Number from before the Second World War. With the information found on the cadasters and on the associated maps, I was able to follow the streets of my ancestral village since they did not change at all in the last 160 years!! I was able to walk up and down the streets and know exactly who lived in these houses over one hundred years earlier. Of course, most of the houses were newer, as the village was the scene of some of the most fierce fighting during WWII. However, from meeting the residents, I discovered that often the SAME family lived in the house. For more information on cadasters, read my article on the TsDIAL, the Central State Historical Archive of Ukraine, city of Lviv. The article covers the archive's holdings, policies and procedures, as well as an interview with the director Dr. Diana Pelts, click on the link below. I wrote this article for Rodziny, official publication of the Polish Genealogical Society, Summer 2001 issue. You'll need Adobe Acrobat Reader to read the article. If you don't have a copy of this installed on your computer, you can download a free copy from the Adobe site. You can view a "no frills" copy of the article. This copy does not include any of the graphics and pictures which appear in the PDF format from the original publication.